Days of the week don’t carry any significance before 7am on the Avenida Caracas. Steel shutters are firmly down, padlocks in place, perhaps the only change seen is in the people and the new gangland tags, scrawled and skewed onto private property. The Avenida Caracas, once a regal boulevard of mansions and opulence, is today in sections a version of Bogota’s own Delmar Divide. I am walking through Chapinero, first passing alongside the pawn shops, the knock-off electrical goods stores and towards Flores before cutting back through the southern limits of the Barrios Unidos, La Esperanza and the Siete de Agosto. One detail is the ever blinking strings of fairy lights announcing the 24 hour business of rooms by the hour in a plethora of motels or love hotels found here. Gaudy names with a hat tip to the exotic and kitsch are announced by attendants waving cars into discreet parking bays. A couple exits not noticing the aquarium in the doorway. They are both smiling yet his head is high and hers remains fixed on the crazy paving as if not to catch my eye. One block west of the Avenida Caracas on Calle 64 and in front of a bathroom appliance shop two homeless men compare small plastic bottles. They look my way as I pass, but, their gaze falls on my faithful 40 kilo canine companion and they think better of approaching. I doubt they’re hungry anyway, the yellow bottles contain boxer glue and huffing kills the appetite. Once maybe the Avenida Caracas was considered to be paved with gold in Bogota’s glory years. Now, the shimmer on the asphalt is nothing more than the shards of windscreen glass or crystals from car wing mirrors resulting from late night automobile accidents and possible atracos. The one constant is the misery. The Avenida Caracas represents one of many socio economic divides in Bogota, second perhaps only to the Calle de los Comuneros separating downtown from the south. Windows thick with dark grime are blanketed with large plastic For Sale signs and non-descript sheet metal doorways suggest low incomes and a perilous existence. A portrait of the unloved Avenida Caracas. 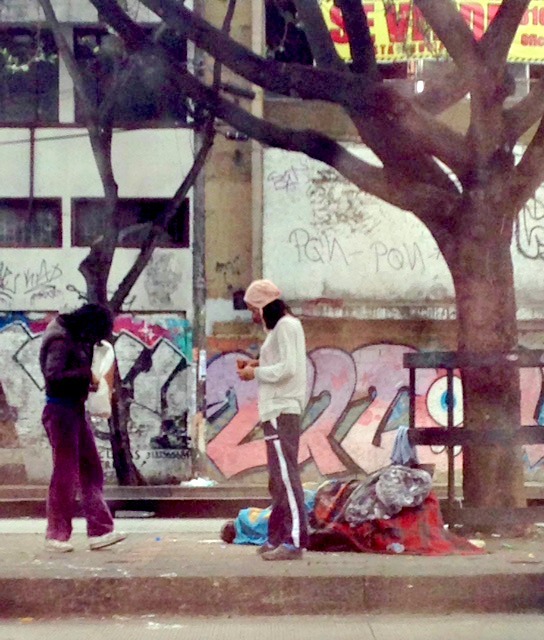 This entry was posted in Journeys and tagged avenida caracas, bogota, Calle de los comuneros, chapinero bogota, colombia, delmar divide, homelessness, love hotels in Bogota, motels in Bogota. Bookmark the permalink. The creaking shunting buses of the Transmilenio spluttering and fuming; inelegant Kharons ferrying us to the underworld. I am not going to attempt any poetry myself. 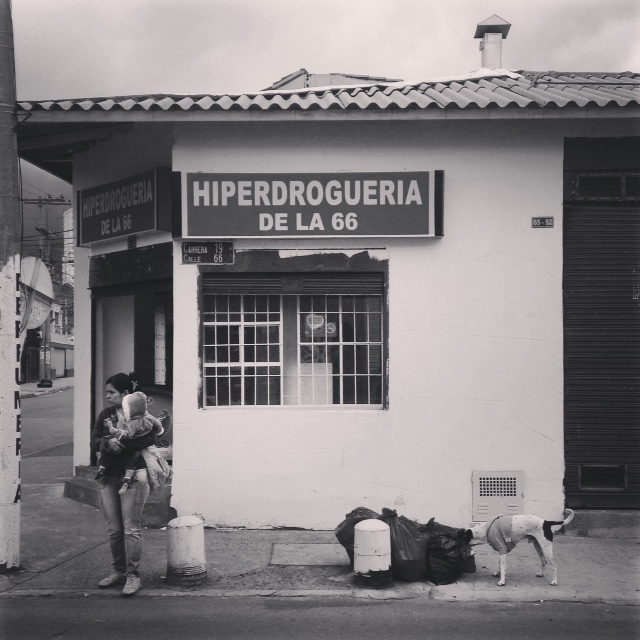 Top-quality writing it is though, and an interesting perspective on one of Bogotá's grittier neighbourhoods. Thank you Paul. Very kind. 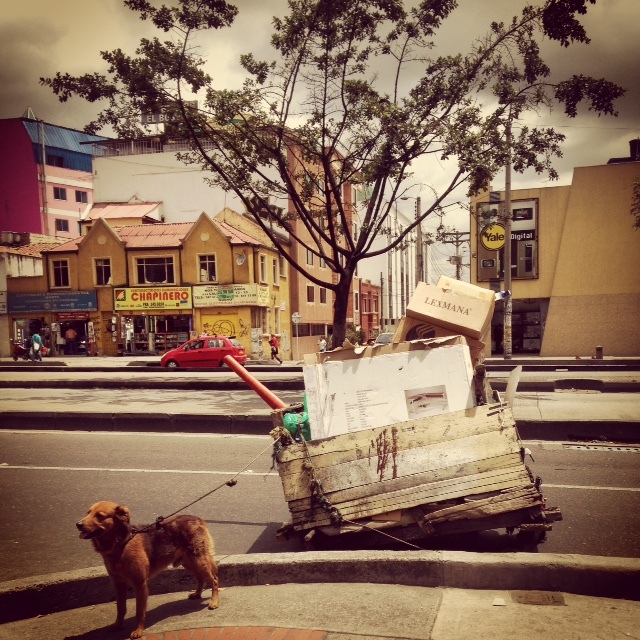 I first went to Colombia in 1983 and I remember the moment where I thought "this place is awful…what am I doing here?" It was on Caracas and 60-something, on a Sunday afternoon. Between the hardware stores and the incongruously located Patronato Nacional de Artes y Ciencias…which I see (online) has moved to Teusaquillo. I can just imagine! 1980s Bogota and the Avenida Caracas itself, do you have photos Rich? I have a photo of Galán at a rally in Usme, but nothing from Av Caracas….who'd want to take a photo of that? I will say what I just commented to your Loudes post, Chapinero itself was actually better in the 1980s than it is now.